HALF YEAR ITALIAN | A small sampling of reasons why I love being a part-time Italian. A small sampling of reasons why I love being a part-time Italian. Expatriate (Merriam-Webster): living in a foreign land. When I think back at how I envisioned my life to be while staying in Italy for months at a time, “people” never played a particularly big part in any of my mental scenarios. I’m sure I expected that this many years out, my Italian would be MUCH better than it is, and I would have more Italian friends than I now have. And that might have been true had I chosen to live in a smaller town in a more remote area where if I had wanted to communicate with anyone, I would have been forced to learn their language. But Orvieto is close to just about everything, making it a great place for stranieri (foreigners) to hang out. And let’s face it: 1. fortunately for me, the most common language for all travelers these days is English; and 2. everyone automatically defaults to the language they can most easily use to discuss whatever topic they choose. (I tell anyone annoying enough to whine when the message “Presione dos para el espanol” comes on an American voice system to stop being so ethnocentric and mean-spirited, because I’d be in heaven if Telecom Italia offered that service.) The result has been a diverse array of friends and acquaintances who are much more fun than I could ever have imagined 9 years ago. The most unifying thing we all have in common (other than English) is that we’ve chosen to be here. Usually people are where they are because they were born in the town, or moved there because of jobs — their parents’, their spouse’s or their own — or want to be near someone else who’s living there – like children and grandchildren. The closest thing I’ve seen in the US to expat life here is a vacation community, where people have decided a geographical area suits them and they move there. What sets apart living in Italy (and probably any foreign country, for that matter) is that the stranieri are not all Americans. Here I have friends and acquaintances from England, Germany, Spain, Switzerland, Holland, Sweden, Finland, Cameroon, New Zealand, Australia, India and Canada. While some still work, most are retired. The Orvietani are not known in Italy as particularly friendly people and can consider anyone from 5 miles away stranieri. 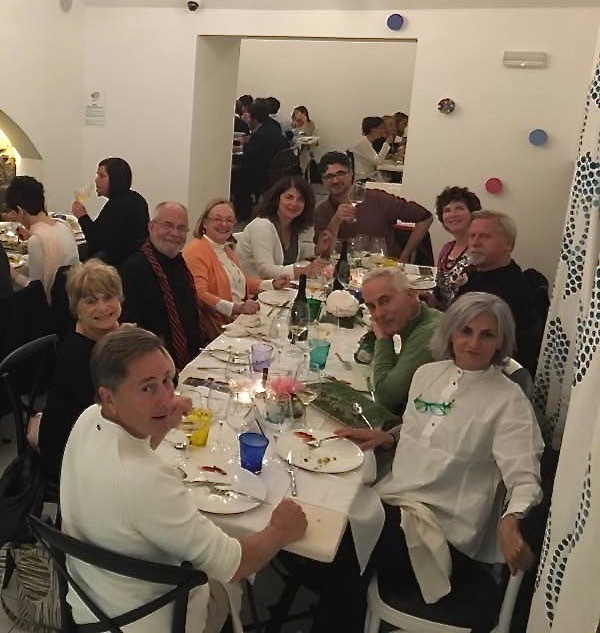 So there are also Italians who fall into the expat classification – from Rome or Venice….or the village 5 miles away….and we can add them to the mix. Stir these different origins, life experiences and perspectives together, and you really have to look hard and long to find boring conversations. In fact, if you do find one, you probably brought it with you. True — from an international standpoint we only had 1 English and 2 Italians at this particular dinner, however the chef was from Holland, his wife was Irish/Australian and they, along with the Italian restaurant owner, were presenting us with a Thai dinner. And again – size plays an important role in making this very pleasant social scene. Towns around our size are large enough to have attracted a critical mass of expats without being overrun by them, but are not too big to prevent the mass from ever reaching that all-important critical stage, as Rome and Milan might be. But how do you find people to hang out with?? Well – our particular expat community is very adept at passing people along. I can trace all the people I know to one particular incident that happened in 2006 – before I even thought about living here – and the generosity of one couple – Candace and Frank – who had been introducing people to each other for years before that. All you need to do is get into a conversation with someone who looks like they know the town, and they’ll perhaps tell you about a group aperitivo gathering that evening, where someone else in the group might suggest heading to dinner after, at the end of which someone who just joined the table might suggest plans to get together that weekend for a meal in a nearby town close to the sea, after which……… You get the idea. And then one day you’ll be having un caffe and some English-speaking people — who could be from anywhere — will sit next to you and you’ll start talking and find you enjoy them, and you’ll invite them to an aperitivo gathering of friends that evening…………… And it starts all over again. As with several pieces I’ve written, this one starts with my friend-from-first-grade Nancy. 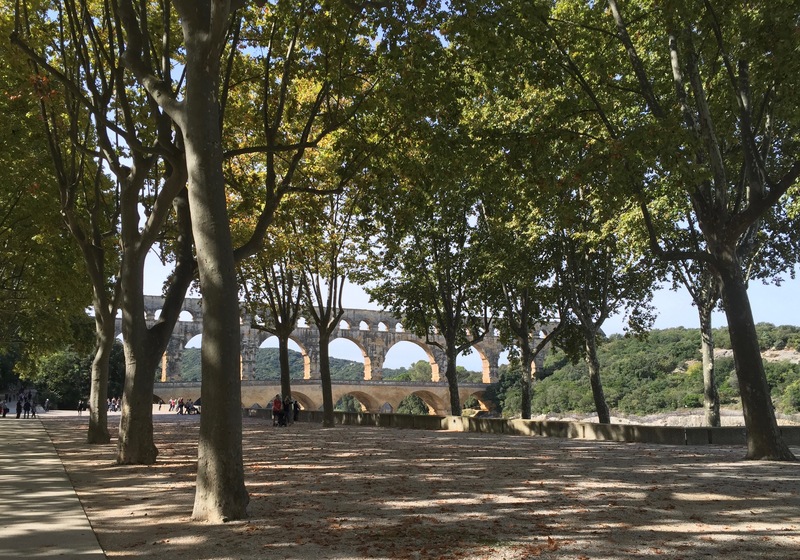 She said that she and her cousin Kathy had picked Provence as the destination for their 2015 annual hiking trip. I immediately started making a mental list of all the wonderful places they must see, but when I got to Saint-Remy-de-Provence, I suddenly felt a pang of what I will call homesickness. Twenty years ago, if you had told me I’d be living outside the US for half the year, the country would have been a toss-up between France and Italy, and Saint-Remy would have been my French Orvieto. I hadn’t been back since 2008, and the chance to meet Nancy and Kathy in Avignon before their hiking started was the perfect excuse to revisit my second most favorite area of the world. Alan, being much more of a traveller than I am, threw himself into the task of making the drive there as interesting as possible, and armed with actual paper maps (remember them????) and a little help from Google, planned what turned out to be THE most wonderful ride of my life. When it comes to car travel, I have the Short Attention Span Syndrome, whereby no matter how blindingly beautiful the scenery is, I get bored after a half hour. But the genius in Alan’s route was that the scenery changed every half hour…..and it changed dramatically. We had everything from a mountain pass with snow showers at the highest point, to a dry, lunar-like landscape, to forests starting to show their Fall colors, to rolling farm land, to an off-season ski resort getting ready for the coming crowds, to calm lakes, to a small section of the Grand Canyon of the Verdon River. The only bad part of the ride was the very uncomfortable half-hour we had trying to hug the side of a frighteningly steep mountain on an incredibly narrow road….parts of which were partially washed out. Alan is a VERY good driver, and even he couldn’t bear to look down. And of course, once you got on the road, there was no getting off. All I will say about that particular half hour is that we definitely were NOT bored. But the frightening road was our fault for being on it in the first place. The other roads? As soon as we crossed the border from Italy into France, it was a different world. The surfaces were smooth, the road-sides clean, the vegetation neatly trimmed. It was seriously UN-Italian. 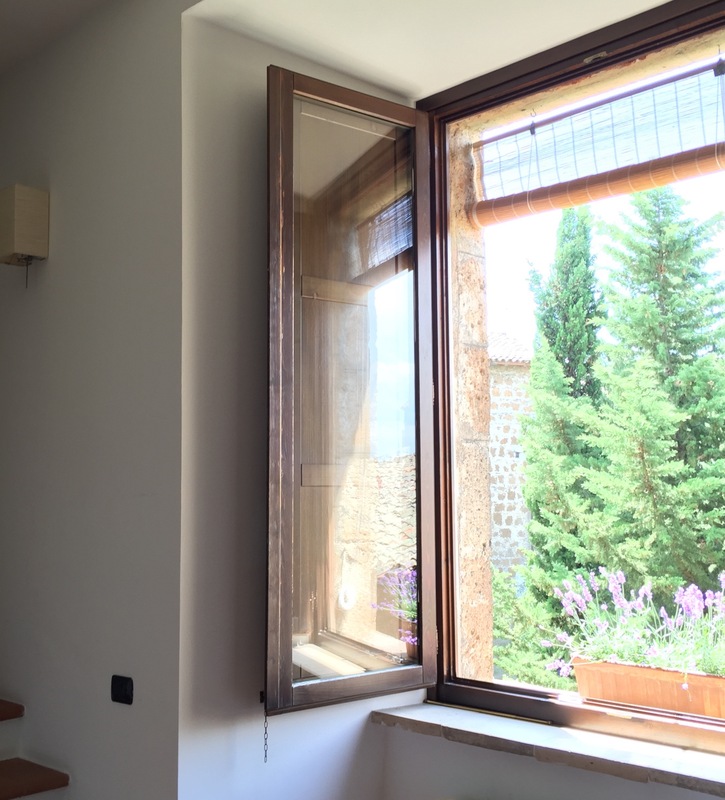 That night we stayed in Moustiers-Ste-Marie – an absolutely beautiful little French town. Let me warn you right now…..by the end of this piece, you’re going to be so tired of that phrase: “an absolutely beautiful little French town”, because our whole trip was going from one absolutely beautiful little French town to another absolutely beautiful little French town. Just as our harrowing mountain ride was the exception to “the most beautiful ride of my life”, so the outskirts of Avignon were the only exception to our “absolutely beautiful little French town” experience. They basically looked like the outskirts of most American towns of that size. But once you get inside the walls, Avignon is lovely – beautifully maintained buildings and tree-line streets everywhere. And as I believe I’ve mentioned before – NO ONE tree-lines like the French. I guess I needn’t tell you that we ate and drank VERY well. After they went off hiking, we embarked on our true mission: rose’ wine. Picture my hierarchy of wine like an ice cream sundae. Wine in general would be the ice cream, a crisp, dry rose’ is the chocolate sauce, a Provencal rose’ is the sprinkled nuts, a rose’ from Bandol is the whipped cream, and Domaine Tempier is the cherry on top — my #1 most favorite wine. It’s over my usual wine budget in the US – WHEN you can find it, which is almost never. I considered this the perfect opportunity to go to The Source, which I figured had to be cheaper than in the US, and my goal was to hot-foot it back to Italy with a case or two of Domaine Tempier stowed in the trunk. I had picked the nearby town of Le Cadiere d’Azur to stay, because it was quite close to the winery. It turned out to be – not surprising – an absolutely beautiful little French town. And so we set off to procure my treasured wine. Except that when we entered the winery, there was only a bottle of their Bandol red displayed. And that’s when we learned the cost of having your favorite type of wine become popular: they had sold out of it. This was the first week in October, and Domaine Tempier had NO rose’ left….had not had any since August, in fact. The next available rose’ would be their release in the Spring. And they weren’t the only producer to be sold out. Now I know that there are many, many worse things in this world than having your favorite wine be sold out…..let’s think Syria or Boko Haram……but it was disappointing. However, we managed to drink and buy some of the “sprinkled nuts” and “whipped cream” level wines, and of course, we got to visit a lot of absolutely beautiful little French towns…..such as Le Beausset – a town we’d never heard of and probably won’t ever see again. We wandered in, searching for lunch, and found the place with red umbrellas in the photo. I’m showing you last year’s photo of it because – and I know this is hard to believe — it is even less attractive this year. This is a piazza almost all tourists go through in an important “tourist town”. One can only dream of what it might look like in the hands of the French….. 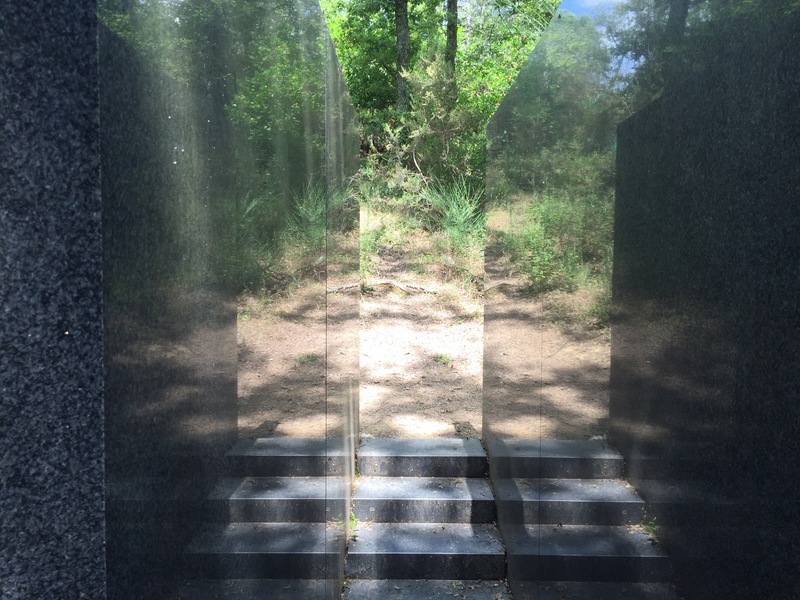 I absolutely ADORE sculpture gardens – the idea of very creative people making something none of the rest of us could ever imagine, and putting it in a setting that opens their idea to all that nature has to offer. 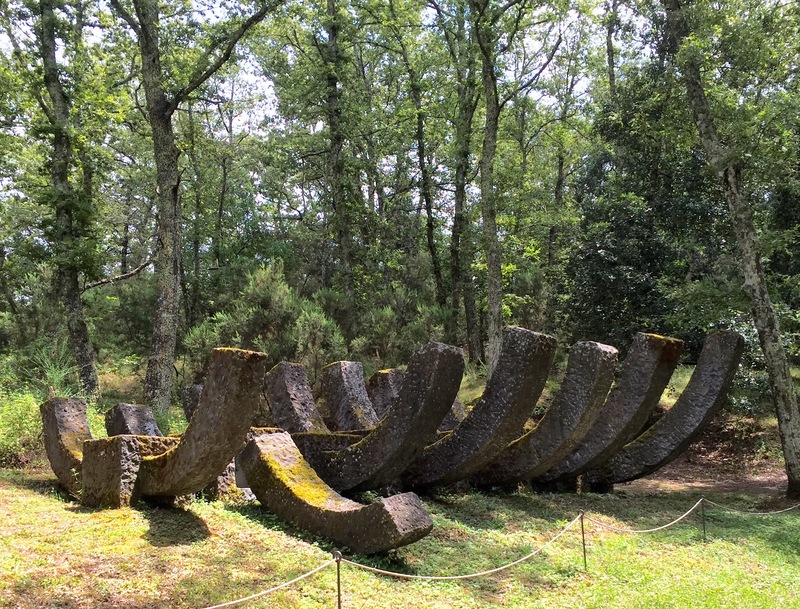 So when Alan came across a past New York Times “36 Hours in Chianti” article that mentioned the Parco Sculture del Chianti near Siena, I immediately put it at the top of my “To Do” list for our short visit to that area. I was not disappointed. It’s FABULOUS!!!! 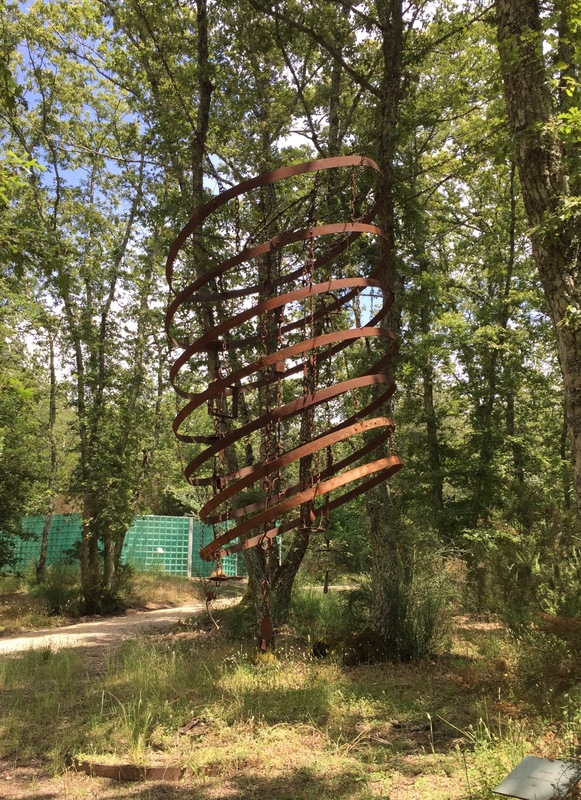 What is disappointing, though, is that no one we talked to knew much about the park…..including the people around Chianti….even though the National Geographic had it as one of “The 10 Best Sculpture Parks” in the world. I presume those in the art world are familiar with it, but since I think it deserves a MUCH wider audience….an audience I’ll call “everyone I know”….I now consider it my duty to tell you, as well as anyone I might meet, all about it. In fact, I was able to start spreading the word the night of my visit, describing it to strangers at the table next to ours during dinner, even though they were heading back to Scotland the following day. No one will escape my enthusiasm!! First — all the background I know…..which, lucky for you, isn’t much. 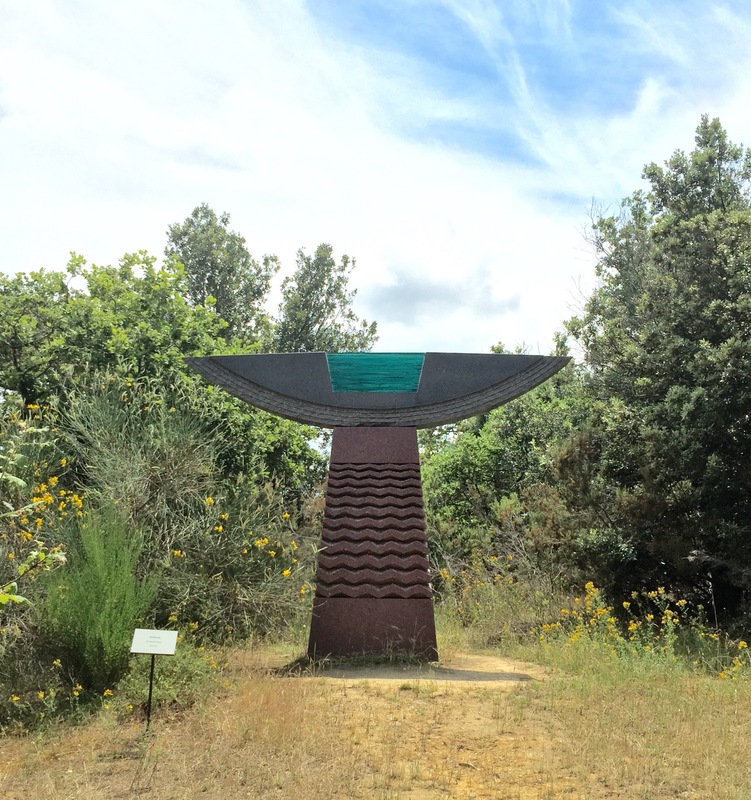 The park is on 17 heavily wooded acres – a parcel that was bought by contemporary art lovers Piero and Rosalba Giadrossi for the express purpose of turning it into a sculpture garden. The land was absolutely perfect because it had been a wild boar farm, and therefore was already completely fenced. 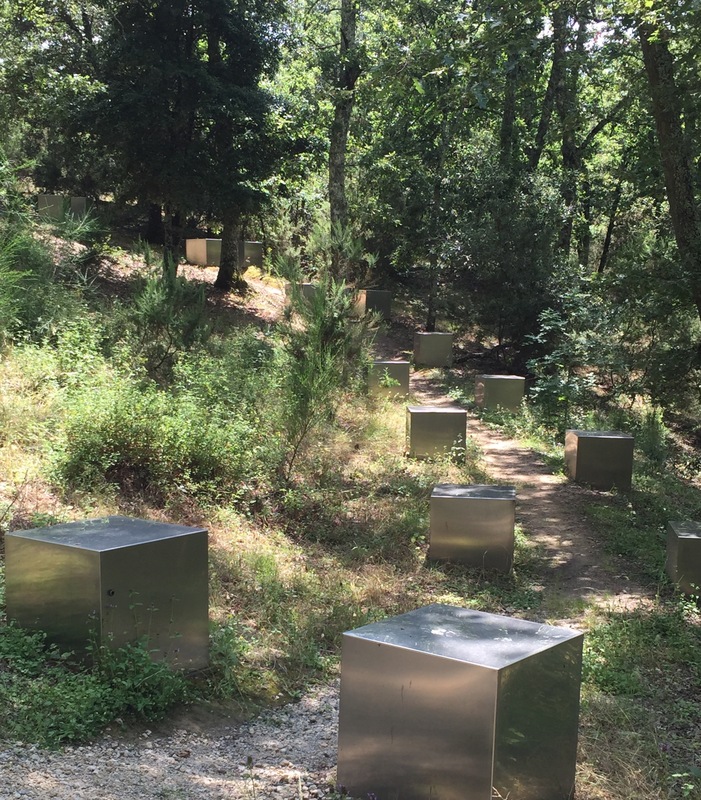 Although not a large property, the 1 kilometer path meanders down a hill, over a bridge crossing a small ravine, and up the other side…..the perfect distance for even non modern art lovers to enjoy a nice walk with wonderful surprises tucked among the trees. How were the pieces on display chosen, you might ask. Well, the goal was to have works from artists in countries not usually associated with large sculptures, and who, though known in their country, were not particularly well-known outside. So while many came from the US and Europe, they also have artists who call Indonesia, Zimbabwe, Egypt, S. Korea, Turkey and Singapore home. I don’t know the name of this one, and I really can’t explain it except to say that I was in a narrow space where the outside is reflected in the stone. Teak — This one had even me scratching my head. 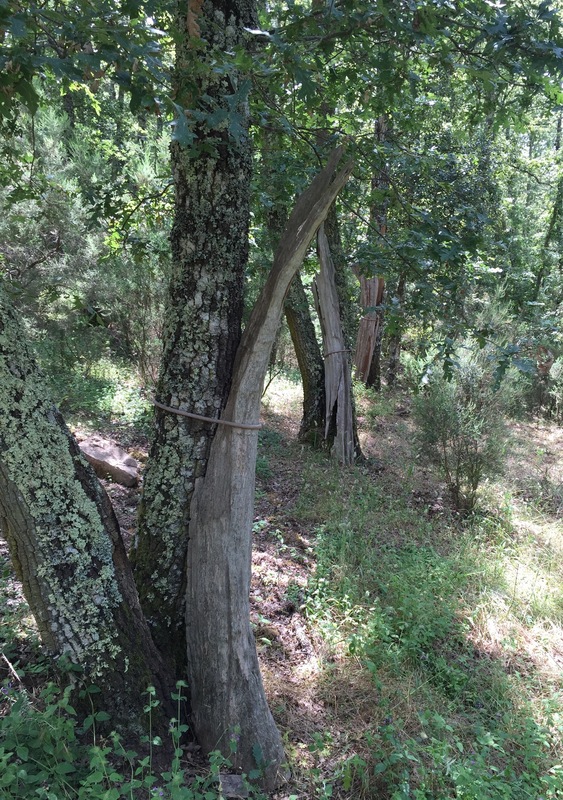 It’s pieces of teak tied to the indigenous oaks. Perhaps it’s meant to represent “2 diverse cultures tied together”. Still….as a work of art, it’s certainly not going to have the same longevity as Keel….meaning at some point in the future, it will represent “2 diverse cultures disintegrated by time”. Energy — This was by far my favorite, and there’s no way a photo can do it justice. 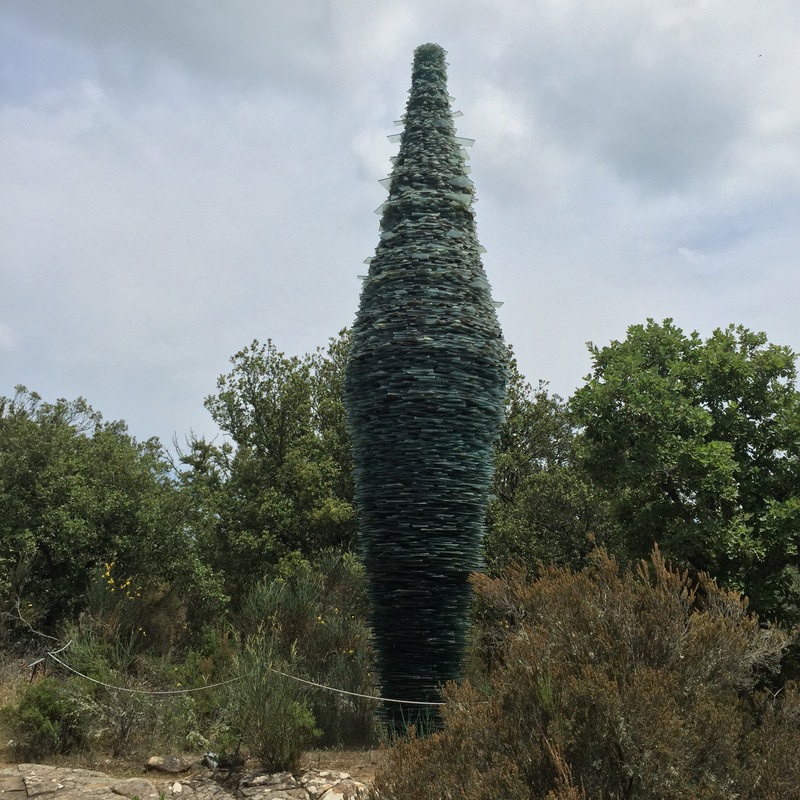 Think of it as a glass cypress tree. It had to be constructed on the spot, with its central pole being buried over 6 feet in the ground. Its only problem: it’s impossible to clean. 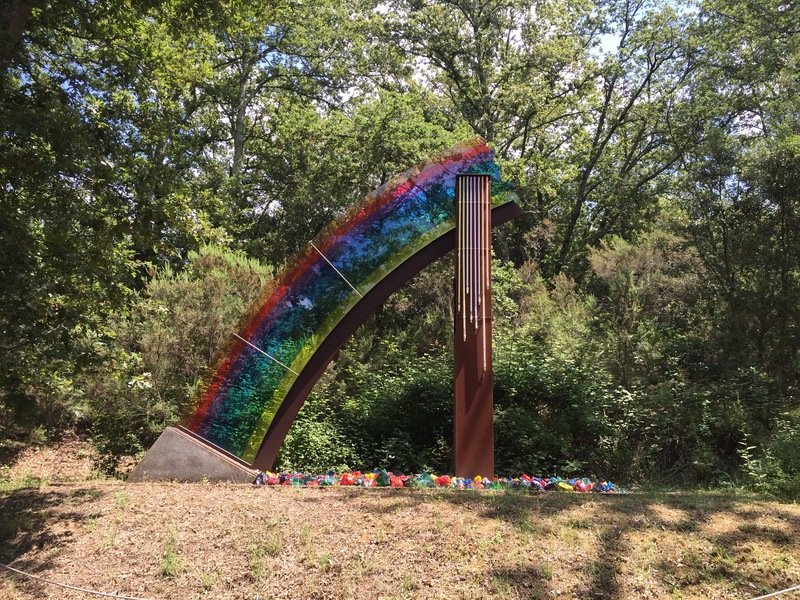 Rainbow Crash — After all the pieces that blend into the woods, it was a pleasant surprise to come upon this. and combinations of all of the above. The Giadrossis live across the street from the park in a gorgeous home/museum/gallery built out of a former terra cotta factory. Each artist came to stay with them to visit the park, soak up the atmosphere for inspiration and decide exactly where they wanted their piece to go. I was lucky enough to speak with Dr. Giadrossi when I visited the museum/gallery and he said there were very few of the artists’ ideas he and his wife turned down. He also mentioned that while the artists were completely different from each other, the one common thread they had was that all 25 enjoyed drinking. He didn’t exactly say that it was a requirement, but I got the impression that he felt inspiration was considerably enhanced when sitting around the table enjoying a glass or 2 of Chianti Classico. I asked how the pieces were installed. Some were built back in the artist’s own studio and shipped whole to the park, while others came in pieces with explicit directions for assembling. I picture this as bringing home a box for an Ikea cabinet, but with a vastly more interesting finished product. 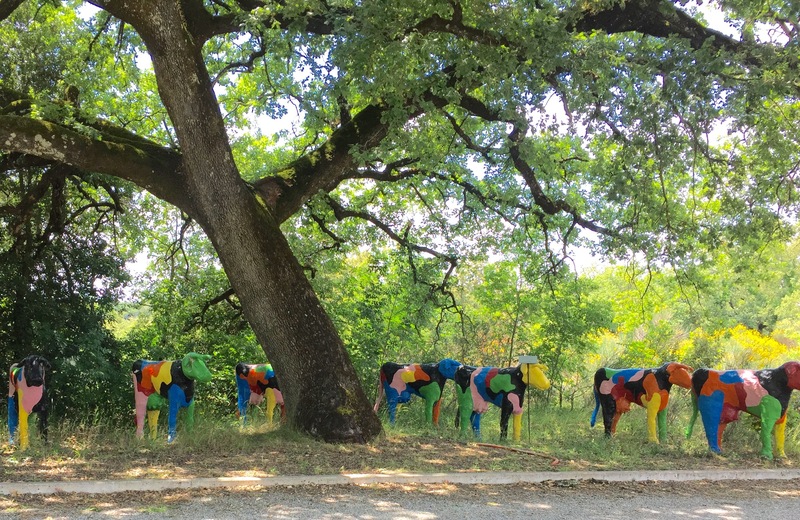 In several cases, the artist had to come back to supervise the installation, and in a few (like Energy), the pieces themselves had to be produced on the site. Of course, it’s nice to have a “back yard” that’s big enough for these giant peppers…. 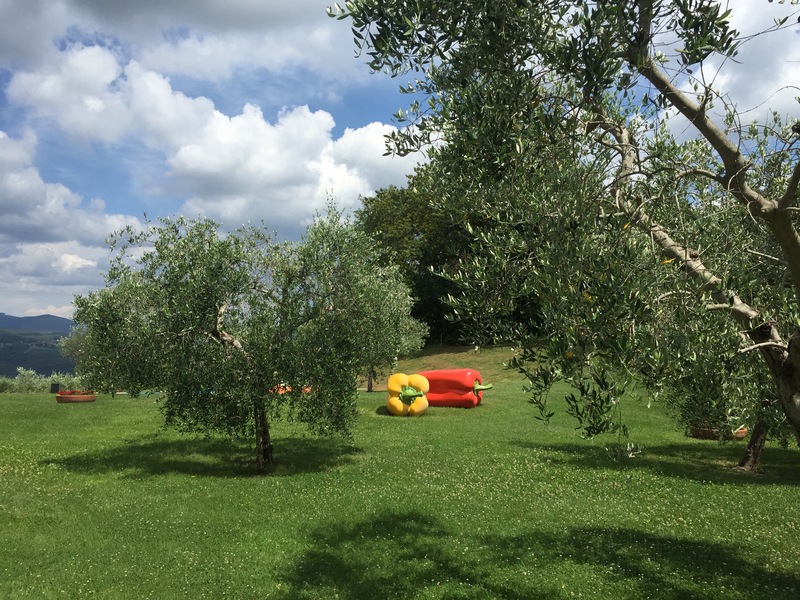 The Chianti region of Italy, between Florence and Siena, is one of the most iconic and most visited, and since you need a car in order to enjoy its lovely small towns and drop-dead gorgeous countryside, plug Parco Sculture del Chianti into your GPS. I’m betting that night at dinner even those of you who normally hate regular museums willl be pestering the people at the next table….telling them that they simply MUST go. And you’re so focused on the totally confusing map on the wall, trying to figure out how you can get to the Duomo (NOTE: The map will not help you get there) that you would never think to give attention to the wall itself, and even if you did, there’d be no reason to notice what else is on the wall other than the map. But look more closely at the photo. See the wiring? It’s everywhere. It connects this building with the one next to it as well as the one across the street. And then who knows what wires connect those buildings to others nearby. It’s like a web woven by a spider who spent too much time in Haight-Ashbury during the 60’s. that the there’s quite a bit of distance between the edges of the outside and inside walls – in this case just over 3-1/2 feet. I don’t know why the discrepancy, but the back wall of our apartment is only 2 feet thick. If the walls were built for defensive purposes, then perhaps they didn’t think the enemy (or since it was a religious building — the devil) would come from that direction. In any case — back in 2011 when I told you about our new kitchen (https://halfyearitalian.wordpress.com/2011/08/17/la-cucina-nuova/, should you care to refresh your memory), I explained how difficult it was to move a light fixture or electric outlet from one wall to another, and if it was that difficult inside, it would be pretty much impossible outside. Hence, wires strung everywhere. Here’s a photo I took from another window, looking at the inner convent courtyard. I considered this one of the top finds in my wiring “collection” because of the incredible jumble — just out there…..exposed to the elements….exposed to vandals….exposed to whatever evil might befall such vulnerable threads of technology. Can you imagine this passing any kind of building inspection in the US? In fact, I’m sure it wouldn’t pass an inspection here for a more modern building. And yet, I’ve not heard of one case of any kind of damage being done to property or people due to the entire infrastructure being, in effect, stapled to the outside walls. I don’t know how old this particular building is, but considering ours is well over 700 years old and has probably endured at least 100 years of electronics, I’m not going to worry about the frailty of Medieval buildings; I’m just going to enjoy my new hobby of seeking out more pieces of wiring artwork. And as for finding the Duomo – forget the map; it will just give you a headache. Better to ask a real person for directions. And then you can enjoy your stroll around town, discovering your own favorite wiring masterpieces to go along with all those guide book “suggestions”. You can now use “wiring” as still another excuse for visiting Italy’s beautiful Medieval towns. It seems that every time I return to Italy after a few months in the US, I can count on something new in town that leaves me asking, “What the hell were they thinking???? ?” This year’s “something new” is that the mysterious “they” – in their infinite wisdom – decided to put an electric car recharging station in the Piazza della Repubblica. To refresh your memory – 2 years ago I wrote about the fact that “they” had managed to do away with traffic in this poor piazza, while at the same time, making it much LESS inviting. When I wrote that piece, it never occurred to me that in 2015, it would look exactly as forlorn as it did in 2013. The best that can be said for “them” during the intervening period is that “they” have at least managed to water the few sparse plants they’ve scattered around, rather than having their planters full of dried twigs. As you can see, lots of space, very little in the way of comfort or greenery. 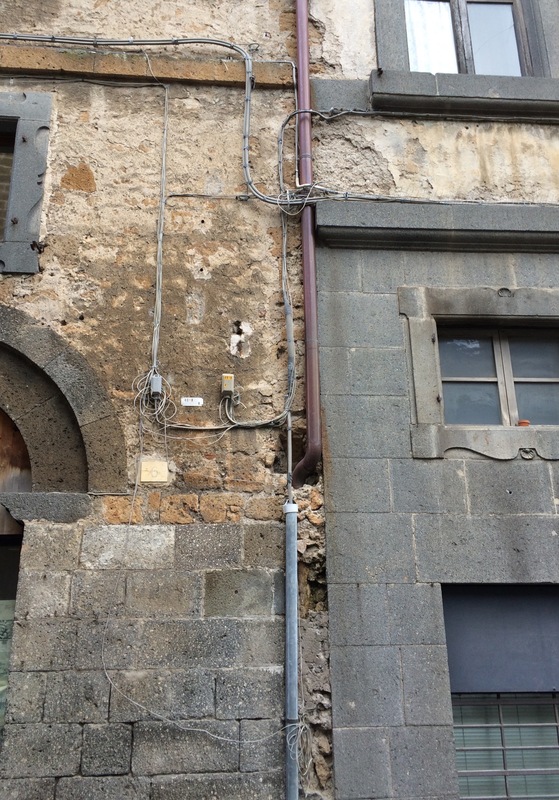 And now, rather than doing some small thing to enhance this poor Cinderella of Orvieto’s 4 main piazze, they put in an electric car recharger. I asked friends if somehow during the short time I was away, Orvieto had been swept up in the electric car craze, but no – none had been spotted in the area and an Italian friend estimated that there were probably less than 1,000 in the whole country. First — being pro-active does not come naturally to Italians in general (you only go to the dentist when you have an excruciating tooth ache….and it better be REALLY excruciating), and pro-activity in the government is for all practical purposes totally nonexistent. Second — politicians always claim the treasury has no money, so if they were ever going to start being pro-active, why would their first attempt be something that is so uncertain and so far in the future. It’s like putting money down on the venue for your daughter’s wedding the day she’s born. Third — by the time electric cars enjoy any kind of popularity — assuming they ever do — this particular recharging station will be an unrecognizable pile of rust. Years from now, this photo will be proof that at one time, the recharge station was bright and clean. OK — then perhaps the electric company, ENEL, funded the installation. Hmmm…..I still have to go with the rust and disintegration taking over before they ever see 1 of the Euro Zone’s equivalent to a penny. Besides — they certainly would have had to get permission from the town, so at most, they would only deserve half the blame. But let’s move on from why this was done and look at the logic of placing it in the Piazza della Repubblica. Traffic can only go around a small edge of the piazza. To their credit, they did have the foresight to put the recharging station in the line of traffic, but the station has only 2 allotted spots. What happens if – miracle of miracles – electric cars really DO take off. What would you do if you pulled up and the spots were being used? You can’t park and wait your turn because this not a parking piazza. 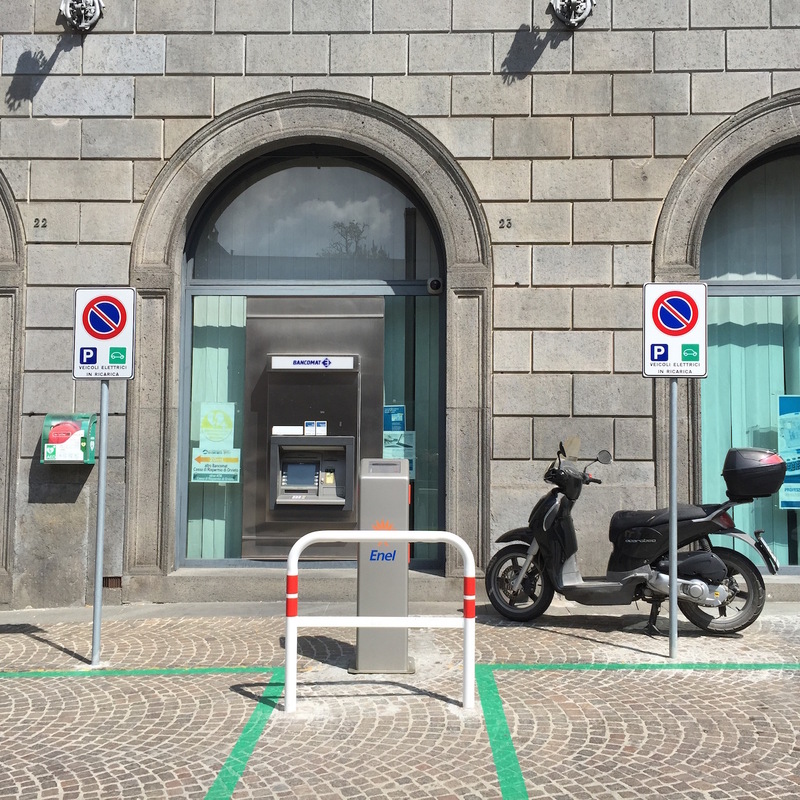 There are, however, 2 other piazze that you can get in and out of much more easily, that do have parking available and that would be much better places to put recharging stations…….IF one is ever needed in the town center. The 2 green (get it????) parking spots, right in front of the bank. You can recharge while getting money from the ATM. So as of now, my conclusion is that this decision to put the station in Piazza della Repubblica was misguided whether electric cars are the next smart phone or a quickly passing fad. Which gets me back to my original question: What the hell were they thinking????? I’ve mentioned this topic in several different pieces, but I think it’s important enough to have its own blog. To reiterate: Most of the businesses we see in our area are small, family owned and run…..whether they’re restaurants or clothing shops or the little grocery stores called alimentari that were surely the inspiration for our 7-Elevens. Even most of the hotels in the smaller towns are family owned. If you go to a hotel regularly in the US, I can pretty much guarantee that you will never see the same face twice. In Umbria, you would become alarmed if you didn’t find the person you expected behind the counter because it could only mean that they were dead. You would probably know them by name, as well as the names of their children. They would have your passport information on file and know which room you preferred. The closest we get to that in the US are our B&B’s. The same goes for restaurants. The waiter in the first restaurant where I ate in Orvieto 21 years ago is still there. It’s not a place we go to often, so I’ve never gotten friendly with the man, but I’m sure that when we do eat there, it clicks in the back of his mind, as it does in mine, that we’ve been seeing each other for an awfully long time. The service people in Italy have pride in what they do; it’s a respected career, not something to fill the time and wallet while waiting for “real” life to begin. Whether or not they are a family member, they still treat you like a guest in their home, because where they work is their home. And like a good guest, you should give them the courtesy of a greeting when you enter, and patience if they can’t get to you immediately. Occasionally, however, you will run into a family member who truly should NOT be in the service business. We have one near us who is legendary for his lack of hospitality. Anyone reading this who has spent time around Orvieto knows this man well. Upon entering, he will immediately make you feel like an unwelcomed guest who has ruined his day by your very presence in his restaurant. His body language lets you know that he considers you totally unworthy to eat the delicious food that comes from his kitchen, and if he could, he would return to watching TV with his back to you in hopes that when he turned around again, you would be gone. Fortunately, the rest of his family members are incredibly nice and the food is so good that the restaurant warrants the return customers and packed house that it has most days. While this man is the exception to the nice-people-in-small-business rule, his ilk can be easily found in the larger chain stores – particularly those in the shopping malls that seem to have mysteriously appeared along the autostrada recently. I’ve never found the kind of department store in Italy that I’ve seen in the US, England, France or Germany, but the closest is a chain called Coin. I’ve been to Coins from Torino to Palermo, and not once have I ever gotten the correct information about whatever I was looking for. If they are out of something, it would never occur to them to see if more might be coming in at some future date, or if they have an alternative. It seems their training stopped right after: “We’re out of those”. In the US, department stores have a disarming number of people whose only job is to ask if they can help you. At Coin, as soon as the sales people see customers, they scurry away to an agreed-upon hiding place, where they stay until the customers get tired of waiting and leave. Large grocery stores are the exception to the big-store rudeness; people there are always helpful and they know what they’re doing. So….what’s the bottom line on all of this? – Smaller places are more fun than big ones. – Be courteous to the people in small businesses. They work long hours in their shops and appreciate a greeting and patience. – You will probably be disappointed in a large store, so if you must go, set your expectations low. – You can raise your expectations up if the large store is a super market. – It is possible to overlook rudeness, but only if there’s REALLY good food at the end. It’s always helpful to participate in a few of the cultural differences you’ll find when visiting another country — particularly if they’re easy to do…..not something like having to cheerfully eat sheep eyeballs. Here are just a few easy-to-adopt suggestions for Italy. Actually, this first one is for both Italy and France: Acknowledge the shopkeeper when you enter her/his shop. Unlike in the US, where you’ll probably never see the person waiting on you again, most of the people behind the counter are the owners — particularly in the smaller towns — and they’ll be there day after day. It really is their second home, so be as courteous as you’d be if you were their guest, and give them a hello when you enter and a goodbye when you leave. Restaurant etiquette #1: Don’t just sit down. Wait for someone to direct you to a table. Restaurant etiquette #2: The first question you’ll be asked is what kind of water you’d like. They do not ask IF you’d like water. The answers are naturale (still water) or frizzante (sparkling). (You could also say gassata, which means the same thing.) Since these are both mineral waters, acqua minerale is not a helpful answer. Unlike in Germany or Switzerland, where we’ve paid up to $10 for a bottle of water, you seldom pay more than $2 in Italy. I suppose you could always say you don’t want any water, or just a glass of acqua di rubinetto (tap water), but….well…..it’s not often done…..and aren’t we talking here about cultural differences you want to practice? Restaurant etiquette #3-A: ……And since you should eat your meal at the proper temperature, it means people should start as soon as the food arrives and not wait for everyone to be served. I know it seems impolite to us, but to Italians, it’s even more impolite to disrespect your meal by not eating it as it should be eaten. Restaurant etiquette #3-B: When I said “proper temperature” in the previous paragraph, I should point out that Italian food is normally neither very hot nor very cold. You MIGHT burn the roof of your mouth on pizza cheese, but that would be the only real possibility. Even coffee will be served so you can drink it now rather than having to wait 5 minutes to let it cool down. And as for chilled foods – I’ve seldom had either my white wine or my acqua frizzante as cold as I like them….not that I’m complaining. “Moderation” is the key word when it comes to “proper temperature” for eating…..
…..And “moderation” is also the word when it comes to drinking. If someone is loud and drunk, there’s at least an 80% chance the person is American, and a 99% chance they’re not Italian. Italians have been drinking since they were children tasting Uncle Giovanni’s homemade wine at family dinners. It is a part of everyday life, and they respect it as such. With our history of restrictive drinking laws, our young people often go wild once they hit Italy. If there’s a broken bottle in the street, there are probably American fingerprints on it. While American youth often look at drinking too much as being the measurement of how much fun they’re having, Italians learn early that being drunk is brutta figura, which loosely means appearing in a way that will be looked down upon – and that’s something NO Italian wants. Last on today’s list is Lane Discipline. I believe I’ve mentioned this before, but it won’t hurt to remind you that on the road, you pass on the left, drive on the right. You should NOT get in the left lane and clog traffic for miles behind you. If you aren’t actively in the process of passing someone, stay on the right. So — I don’t think any of these nods to Italian culture fall into the eating-sheep-eyes category, In fact, now that I’ve re-read them, I see that it’s more like saying “please” and “thank you”. Maybe your mother really was right: it’s all about good manners. Landing in a German airport after the chaos of Rome’s Fiumicino airport is like going from a crowded, humid, sweaty subway up into the fresh, clean countryside. 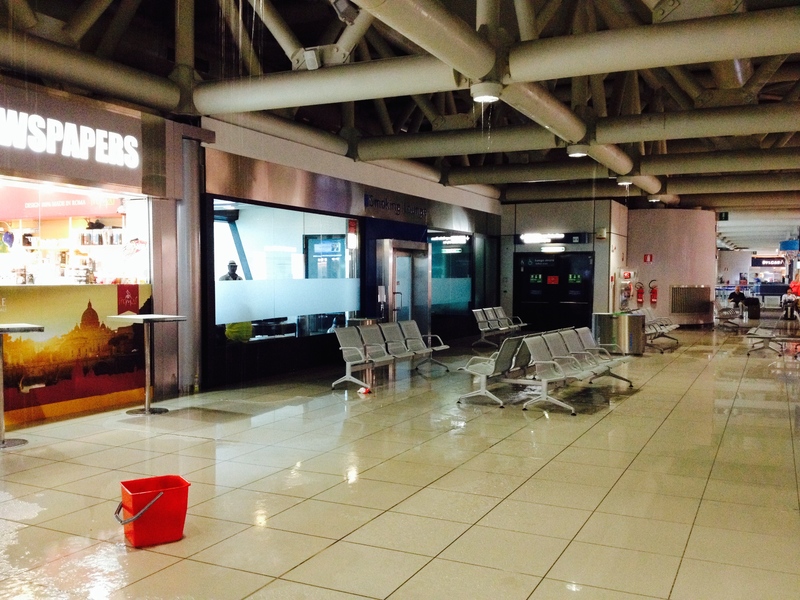 I always fly in and out of Fiumicino, so perhaps the other Italian airports are havens of calm and comfort…..but I wouldn’t bet on it. 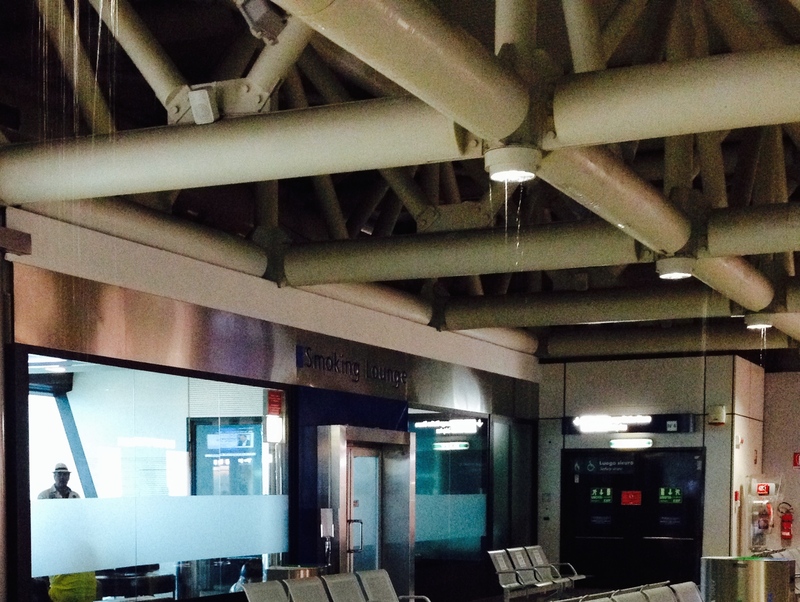 To give you a bit of perspective on Fiumicino, there are 3 main interconnected terminals where you catch your flight, cleverly named Terminal 1, 2 and 3. And then off to the side – away from those, in a separate building — is Terminal 5, which is only for US and Israeli airlines. It has an extra layer or 2 of security. Terminals 1 and 2 are for airlines from the rest of the world outside of Italy, and the only times I’ve used them was to take an Air Berlin flight to either Munich or Hamburg. Needless to say – everything was very organized, the people were friendly and helpful, and it was a pleasant experience – except for the fact that Italians in general do not like air conditioning, the result being that the airport is kept at a sultry 80 degrees in summer. Terminal 3 is just for Alitalia, and you can count on there being at least 3 times as many people as the authorities would deem safe. So in addition to the 80-degree setting on the thermostat, you also have the heat generated by giant herds of very frustrated people. Italians have this reputation of being incredibly friendly, but those friendly Italians do not happen to work at the airport. I think you have to pass a sulking test to be hired. The employees all give off vibes that their lives would be so much better if it weren’t for these needy tourists flocking into their terminals…..expecting help…..if you can imagine such a thing. When I used to take my beloved cat Orson back and forth, I had to fly Alitalia from JFK — 2 hours away….traffic willing. Philadelphia airport is only 20 minutes from my house, but USAirways – the only non-stop to Rome – in an effort to endear itself to pet owners worldwide, does not take any animals anywhere it flies at any time. But at least when I got there, New York’s Alitalia was surprisingly well-organized. Fiumicino’s Terminal 3 Alitalia, on the other hand, gives you the same calm feeling you might have if you were stuck in the middle of Time Square’s New Year’s Eve crowd. To be honest – I do occasionally exaggerate a bit, but this really is the procedure I had to follow when bringing Orse back to the US: Let’s think of Terminal 3 as one of the long New York City blocks….say between 5th Avenue and 6th Avenue. After we entered at 5th Avenue, Orsie, luggage and I had to muscle our way through the tightly packed swarms of people to check in for the JFK flight, which was, of course, on 6th Avenue. When they saw Orson, they would give me a slip of paper acknowledging that I had a cat, which I had to take back to a counter just inside the entrance at 5th Avenue to pay for his “ticket”. This could not be done when we were originally passing by that exact counter; I had to get the paper from the check-in counter first. So I would go to 5th Avenue, pay the extra money, go back to 6th Avenue, and only then would they give me my boarding pass and put a notification on Orson’s cage that he was official. I would then have one final trip to 5th Avenue because that’s where the station was to drop Orsie off to be taken to the plane. 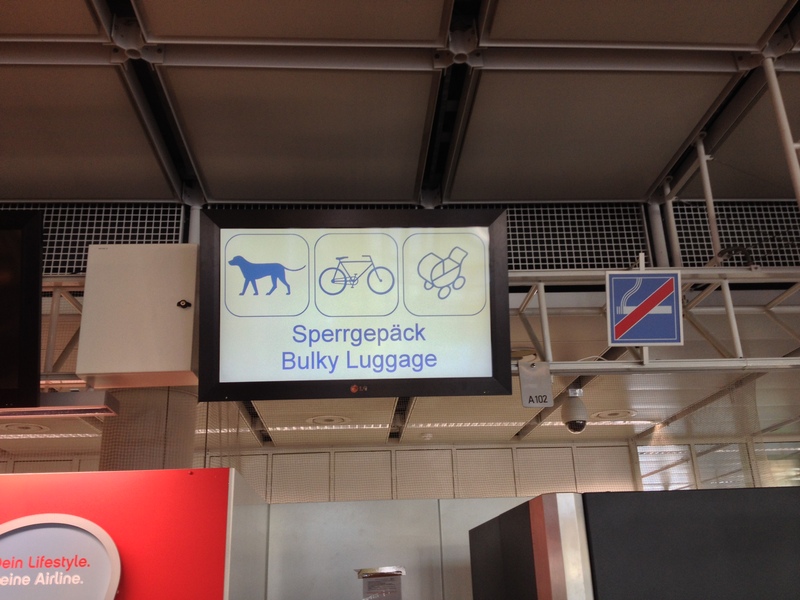 And if you should miss this highly-visible, easily-understood sign, I’m pretty sure that any of the smiling airport employees would know exactly where you could find your pet or bicycle. After Orson died, I went back to the convenience (not to be confused with comfort) of flying USAir, which means I now have much less legroom, and I leave Rome from Terminal 5. The first time I was there, I thought it was a bit creepy to enter the huge entrance room and see machine gun-armed guards patrolling above us on a catwalk just below the ceiling. Now if you see someone up there, they’re probably changing a light bulb. Because this terminal serves so few airlines, it’s relatively calm and orderly, and has the added benefit of being cooler than 80 degrees. Since Terminal 5 is set away from everything else, they have a shuttle to take you to the plane-boarding area, which is fairly new and has shops from a lot of the high-end names – Gucci, Dolce & Gabbana, Fendi, etc. It’s a somewhat pleasant way to say arrivederci to Italy. The last time we were there, we were standing at a counter having our final caffe`, and we could hear rain pounding on the roof. Suddenly, water started pouring out of one light fixture after another, as you can see in Picture #1. Picture #2 gives you the over-all scene. Everyone scurried away from the seats, there was water everywhere, and someone thoughtfully placed one very small red pail where it would definitely NOT catch any of the rain. The high-end shops were not immune from the leaking roof, either, as I saw the sales person in Gucci manning her mop. This is the showcase terminal for one of the world’s most important cities. As we were snapping our photos, we noticed that the others doing the same thing were all non-Italians. The Italians? They just shook their heads and wandered off to find a dry seat, muttering “e` cosi`” — which loosely translates as “that’s just the way things are…..” I don’t know what the equivalent phrase would be in German, but my bet is that they seldom need to say it and if they ever do, it would definitely not be in one of their airports. My favorite seasons to be in Italy are Spring and Fall. The weather is usually (but not always) wonderful and the countryside is (always!!) gorgeous. Another important factor is that there’s enough daylight to see and do the things you’ve always dreamed of seeing and doing. That changes at the end of October when the clocks Fall back. 20+ years ago I was on a bike trip with a truly terrible touring company where daylight savings time ended in the middle of our trip. Had it been a better company, the guide would have been prepared and the routes would have been changed to accommodate less daylight. But this guide had been used to even the slowest of bikers finishing their rides in plenty of light, and he was totally unprepared for people straggling back in the dark. And believe me – there were some VERY unhappy stragglers! So when I hear people planning a trip after the time change, I’m somewhat less than enthusiastic. How can they have the long, leisurely lunch that’s such an enjoyable part of any Italian vacation? They’ll be finished just in time for the sun to go down and won’t be able to see anything on the ride back to their hotel. 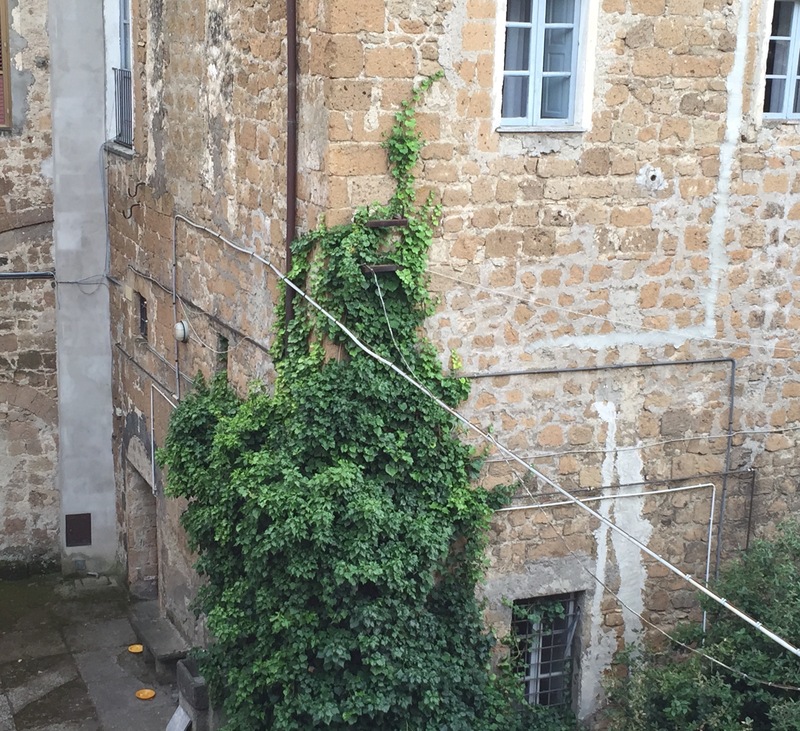 But I changed my mind after I stayed a bit longer one year, and ended up in Orvieto for the olive pressing. I have to admit right up front that I cheated. I did not participate in the olive harvest. I’ve heard it’s much more arduous than the vendemmia for grapes, and our friend Liz’s first-hand-experience blog will tell you all about the harvest part (http://www.myvillageinumbria.com/2012/11/the-fruits-of-our-labor-olive-harvest.html). I was there to reap the benefits of others’ hard labor. 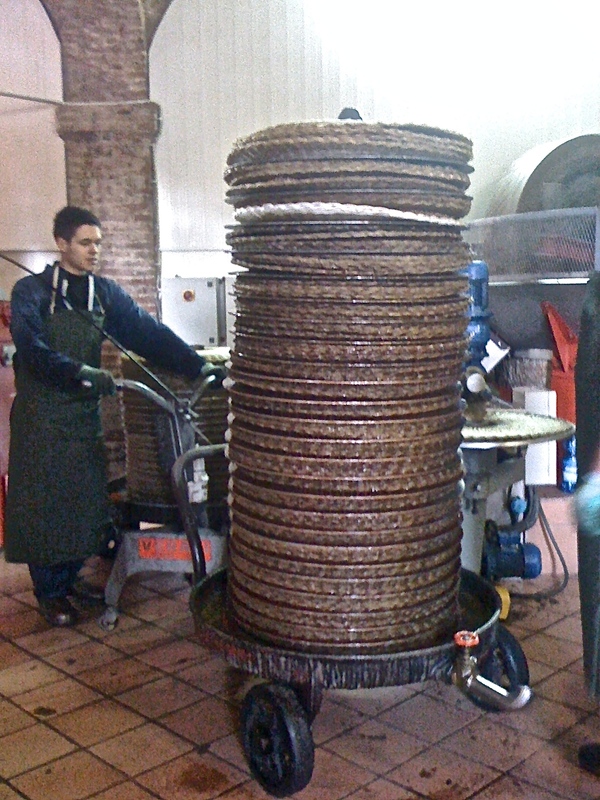 Our friend Brian told me about a frantoio (olive press) in Monterubiaglio, a very small town outside Orvieto. It was early November and the olive harvest had just started. All I wanted to do was buy a few cans to take home, but once I saw the pressing process, I had to hang out there for the rest of the day. you can see the bin of olives on the right, going up the chute to the rotating crushing stones. 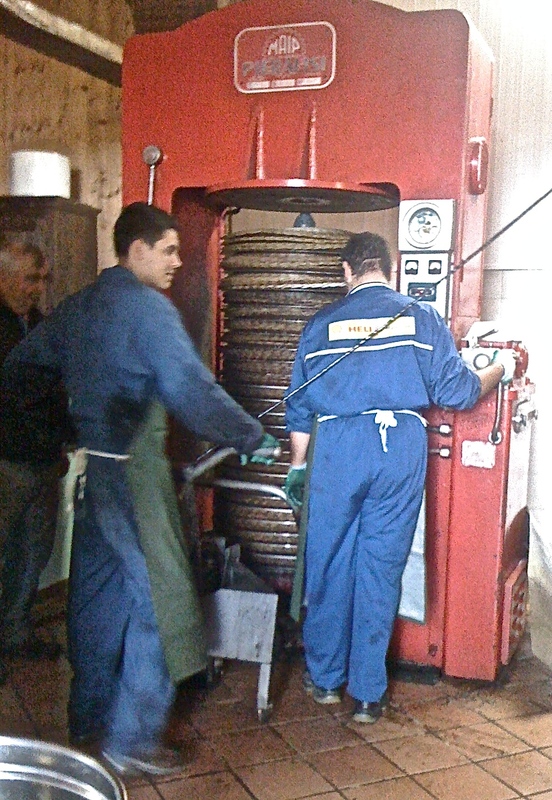 If you look at the metal cylinder sticking out from that blue thing between the 2 men, you can see the crushed olive paste coming out to be placed on a round fiber mat. The mats on the left have already been squeezed. 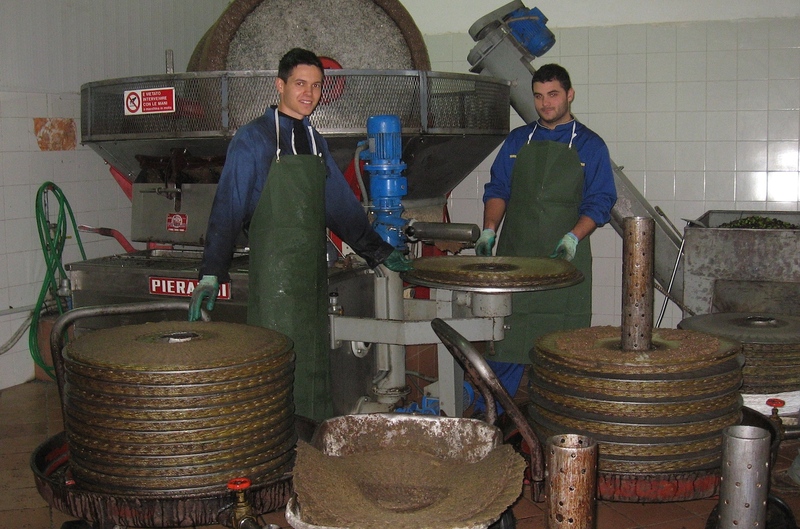 The men discard the olive residue in the wheelbarrow in front of them, spread another helping of paste on now clean mat and pile it on the cylinder on the right. At regular intervals, they put a heavy metal disk between the mats. 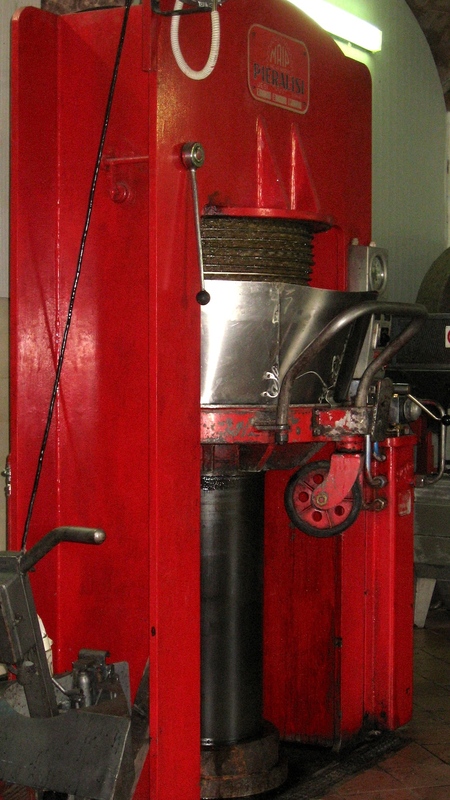 When the stack finally gets impossibly high, they wheel it over to a hydraulic press (pictures #2 & 3). Even before they move it, the oil is starting to seep down the sides because of the weight of the mats and metal disks. The press takes about an hour to compress that tall stack into something a few feet high (photo #4). 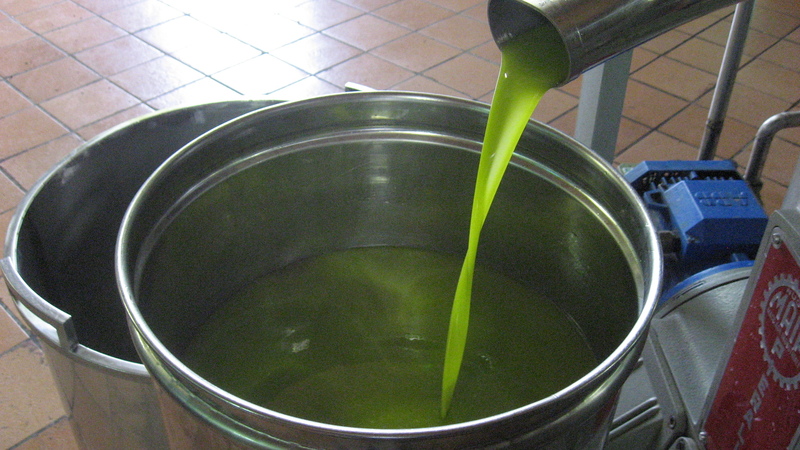 The oil is pumped through a centrifuge to get rid of all the stuff that’s not oil, and then this heavenly day-glo green liquid comes out for us mere mortals to enjoy (picture #5). Since the oil is unfiltered, after a couple of weeks, the particles begin to sink to the bottom of the can and the neon green color starts to fade. So I’m not saying it’s impossible to get this in the US, but it would be difficult to find and very expensive because it would have to be shipped immediately after the pressing and not wait around in a warehouse somewhere. 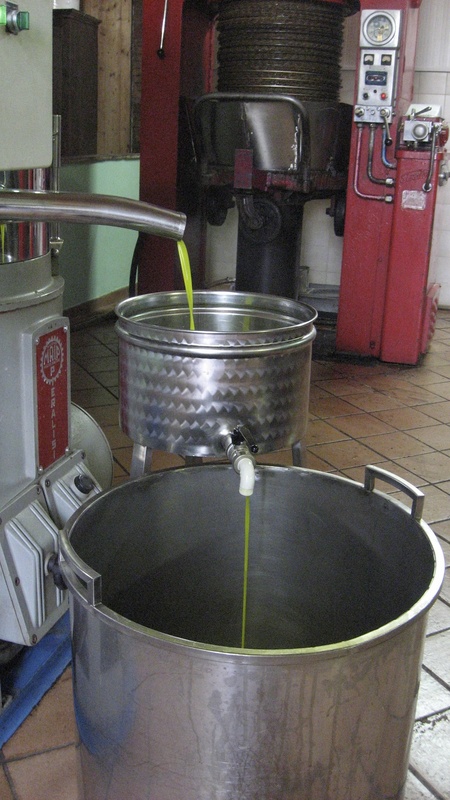 You can buy excellent oil — both filtered and unfiltered — produced by the same method; the label should say “first cold pressed” in addition to “extra virgin”. Yes — it will be delicious, but it won’t have the same pure taste you’ll experience if you’re right there. My afternoon ended with the head of the frantoio inviting me to sit at a table overlooking the operation while he toasted several pieces of bread. 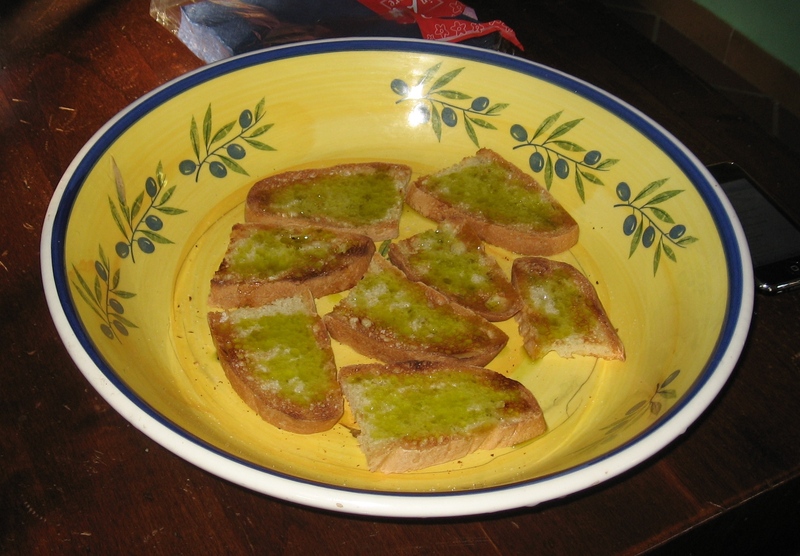 Normally, bread in Umbria and Tuscany is not very tasty because tradition dictates that it not have salt (a centuries old grudge about a long-forgotten salt tax), but drizzling a bit of this gift from the gods over the warm toast transforms it into one of the best things you’ll ever eat. Why am I telling you about this now when the harvest is 3 months away? I’m simply trying to provide a reason why you just might want to put a November trip to Italy on your calendar. And you won’t mind your drive home in the dark one little bit. Thought I’d fill you in on the changes I found when I returned to Italy this year. First the Rome mime/living statue update: You might remember from past pieces, we had: perfectly still Statues of Liberty; golden Egyptian mummies; and the guy who looked like he was dashing to catch a train, with his coat and tie flying back, his arm with the briefcase swinging forward. I don’t think I told you about last year’s team statues. Picture a swami sitting cross legged on the ground in a long orange robe, with one arm held straight out, holding up a thick pole at the top of which is another swami dressed in the same kind of robe, sitting up in the air in the same position. Very dramatic. They’re still around this year, but have been joined by the headless men in suits and ties. The tops of their real heads are hidden just below the shirt collars, and above is a thin metal wire framework made of line-drawing-like features of eyes, eyebrows, hat, etc., which jiggle as the man moves. We actually saw a group of the headless men, and I think they must have been in training, because one of them was having a difficult time breathing through his shirtfront. I’m not sure he’s cut out for the mime business…..at least not in Rome, during the summer. 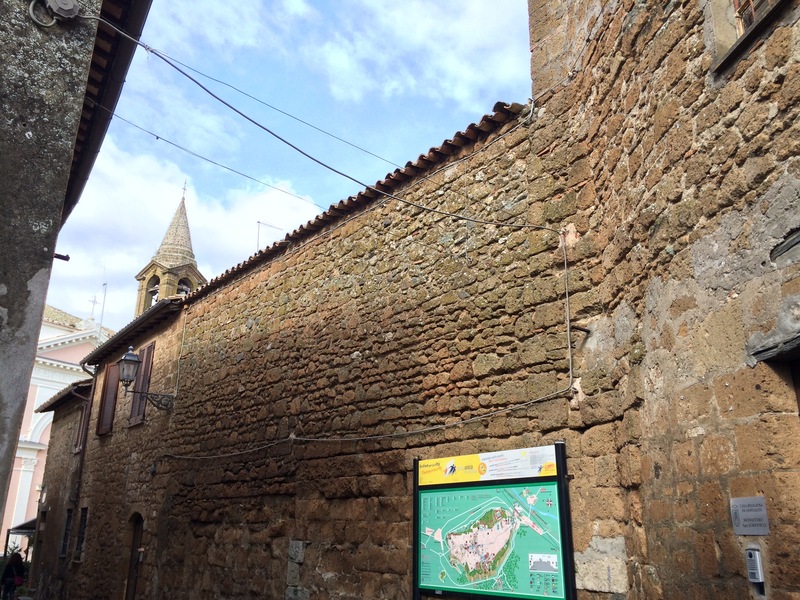 As for Orvieto – there were only a few changes that I could see. First would be that there is now an overabundance of underwear shops on our version of Main Street – 3 within about 100 feet. There was a shop front being redone within that 100 feet, and everyone was hoping it would sell something other than underwear. It turned out to be a gelato shop, which now makes 3 good ice cream shops within 100 feet. I think we can all agree, however, that 3 gelato shops are much more meaningful to everyday life than 3 underwear shops. 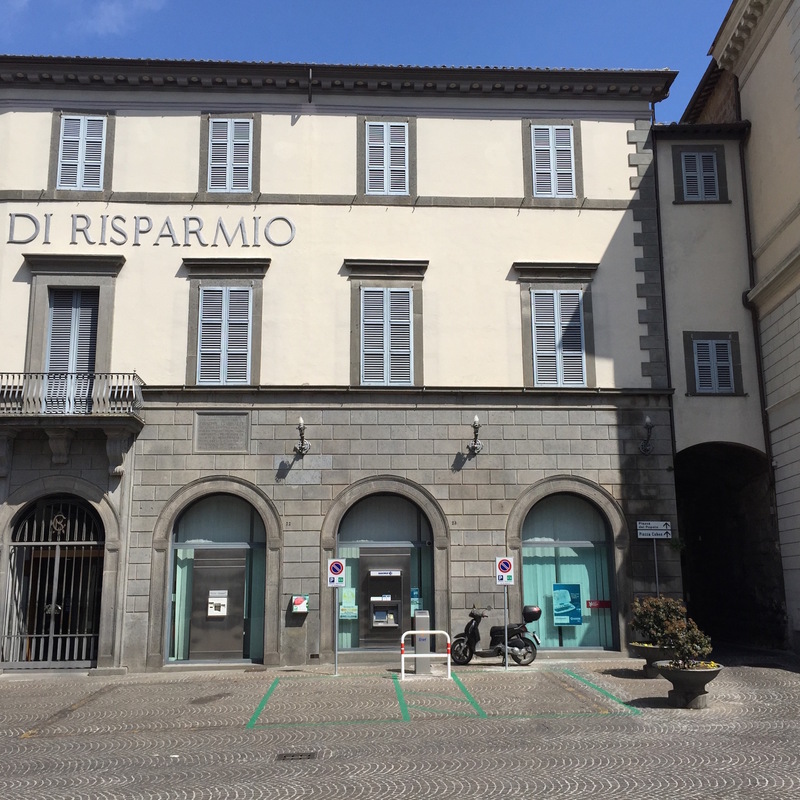 And speaking of stores – awhile back I wrote a piece about the possible future effects from a large new grocery store that had opened in one of the 3 little towns at the base of Orvieto. Well, we returned this year to find that our favorite grocery in another of the towns, the Coop, had opened its new store in our area’s first “mall” complex. As malls go, it’s not particularly impressive, but it pretty much has 1 of everything – women’s clothes, men’s clothes, children’s clothes, shoes, jewelry, coffee shop and a fairly large electronics store. 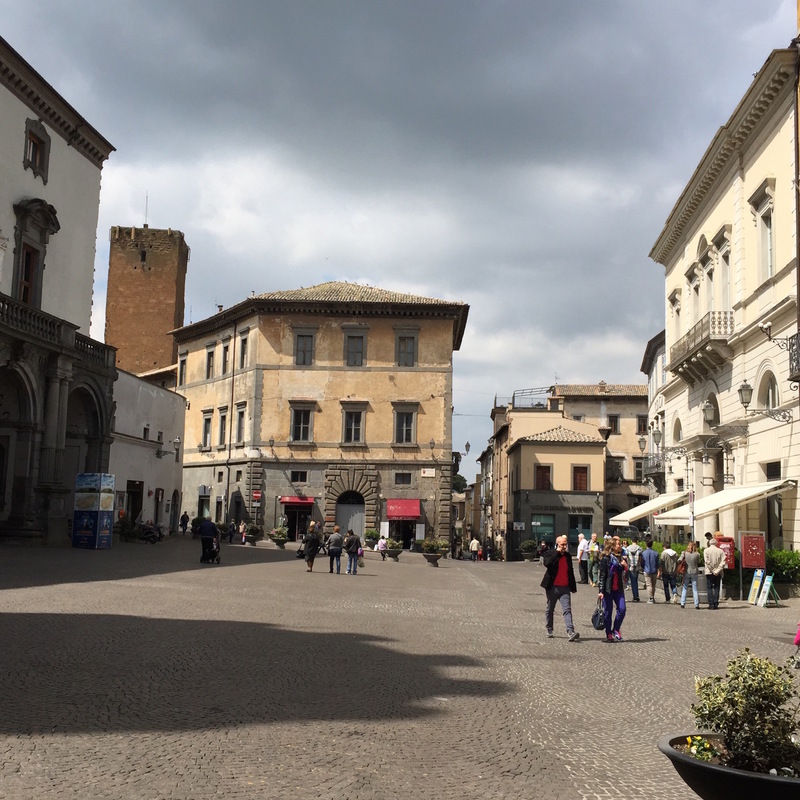 The problem for the mall employees is that when they were individual stores, they closed during the afternoon – just like most small shops still do up in Orvieto proper. However, now that they’ve joined the mall concept, they have to stay open all day, which certainly must take a huge toll on their lifestyles. Meanwhile, back up on the rock, Sidis was our only full grocery store up until a year ago. Since it was the only game in town, it could choose to close from 1:30 to 5:30 every day, and all day Sunday. Last fall another grocery, Meta, opened – staying open all day and till 1 on Sunday. Sidis had to follow along. You can definitely see where all this is leading. If ever I see a 7-Eleven and can get milk anytime I want, I might just have to reconsider my choice of where to spend half the year. I was looking forward to trying a new restaurant people were talking about that had opened after I left at the end of October, and was surprised when it closed before we got the chance. To go to the trouble of refitting a beauty parlor to open a restaurant during the winter when business is notoriously slow, and then close it in the spring, before it picks up again seems….to say the least….odd. I’ll leave it up to you to try to come up with a scenario where that makes good business sense. The biggest change for us, however, is that we got a new bed. For 6 years, we’ve been sleeping on what could be the most uncomfortable bed this side of a bed of nails. Calling it either “firm” or “hard” would be overly generous. It was much less comfortable than sleeping on the tile floor, and you always woke up with something hurting….your back, your shoulder, your neck, your hip. There was no such thing as making it through the night unscathed. As you might remember from my 8/17/11 blog (“La Cucina Nuova”) – the first thing we did when we moved into our rental apartment SIX YEARS ago was put in a new kitchen. We don’t cook. But we do sleep – or at least try to. And yet it took SIX YEARS to finally have the light bulb go off above our collective heads with the idea that perhaps a new mattress and bed might help to make us a bit more perky and less grumpy in the morning. So while I hate to be selfish, the most important change as far as I’m concerned is that we sleep soundly, smile more, grumble less….and we don’t need nearly as much Advil.